It all started about 5 p.m. last Monday night. I was watching the evening news and I heard a quiet little tap on my door. It was the first of many trick or treaters to visit my house the next couple of hours. When I looked out, I saw a green dinosaur wearing a smiley face. He was just getting started and I told him to take a handful from our huge, stainless bowl full of a big assortment of treats. He said “Thank you” and rushed off to show his mom, patiently waiting, what he had chosen. As I said, the dinosaur was the first of many — and the “BOWL,” Pat and I were ready. It was still a few minutes before the big rush and I tried to keep glancing at the TV. In the New England area, where one of our daughters lives, the news was sad. Many areas had to postpone Halloween due to any early Nor’easter that was delivering heavy snow that would cause tree branches and wires to fall. It was said millions of people were affected along the eastern states and millions were without electricity. The areas that had to cancel Halloween were promising the youngsters they would reschedule as soon as it was safe. I really felt sorry for all those kids being aware of how they look forward to the scary night. I was grateful we were not facing the same circumstances because Pat and I also look forward to seeing all those cute — and some frightening — beggars. As I sat waiting for the next group of kids to arrive, I heard an outbreak of yelling, and when I looked out I saw a crazy sight. Witches and ghosts, hobos and tinker bells running out in the middle of the street in front of my house. Parents were joining their kids in the activity as I stepped out to see what the ruckus was. Fortunately, people were stopping their cars and some of them joined in. When I approached, I found out two little puppies from the house across the street had snuck out and were easily eluding the kids and parents chasing them. My neighbor Benny, who is disabled, was passing out treats when his pups dashed out. His neighbors next door joined the chase and after a few more anxious moments, the pets were retrieved and tucked back inside Benny’s house. We now all had a large group of youngsters who wanted to get back to the job at hand — capturing as many treats as possible in their allotted time. As trick or treaters came and went, we were overjoyed with the sight of the kids having such a great time. A large group of kids and parents walked up and as we expected, a small voice sang out, “Hi Fred.” When I looked down there were two of my favorite beggars, the Zimmerman kids, Jentry and Jett. The past few years their kids, first Jentry then joined by brother Jett, have made our Halloween experience extra enjoyable. They are the children of a young man who worked on my charter boat. 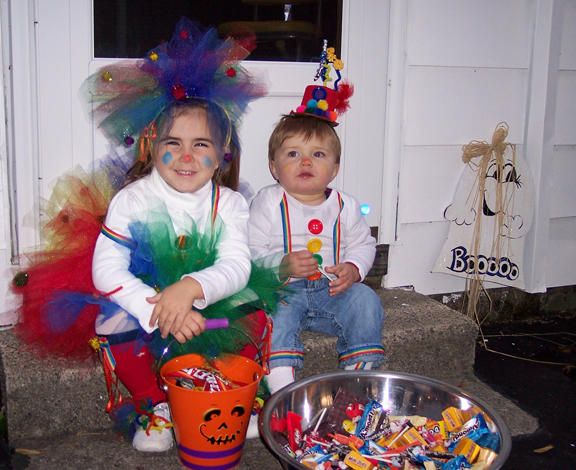 I knew then he would turn out well but who could have guessed his kids would become so special to our Halloween fun. Another Zimmerman with the group had her dog dressed up like a bumblebee. Yes, AS I SEE IT – FUN! That is what Pat and I have on beggar’s night. As the night went on, I shouted hello to my neighbor across the street and he too responded, “This sure is fun, isn’t it.” We were especially happy to see so many parents with their kids, some even in costumes. It seems during these hard times, families are growing closer together. At least that is a positive out of so many negatives lately. And boy, they sure did!